Most consumers are already savvy to identity theft, but there’s another pervasive threat that could impact their own healthcare. According to the Fifth Annual Study on Medical Identity Theft, the number of patients affected by medical theft increased 22 percent over the course of a year. The survey found 2.32 million Americans were victims of medical identity theft with no signs of slowing down. 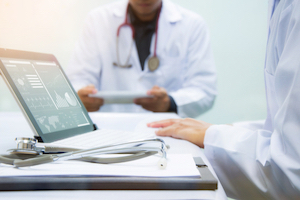 Taking healthcare into the digital age can help streamline the organization and lower overhead costs but opens up Pandora's box where hackers can steal your medical identity to receive health care or obtain personal information like social security numbers. And once someone uses your medical identity to obtain service, your medical records could be tainted with incorrect information about your healthcare needs. Just like your personal identity, consumers need to stay proactive about protecting their medical identity and keep themselves safe. Here’s how to protect yourself. One of your first lines of defense against medical identity theft is diligently reviewing your medical records on a regular basis. Ask your doctor for the most up-to-date medical records for your family and diligently review them for accuracy. Flag even the smallest errors whether a random blood test or prescription request and track it back to its source. It’s possible your doctor made a mistake with your records and can clear it up by cross-referencing it to their hard copies at their office. Otherwise, any incorrect information could be a sign your medical records have been compromised. A reputable identity monitoring service can monitor everything from your credit report to suspicious activity. For example, an identity monitoring service should immediately alert you when your information is used to make an online transaction, apply for a mortgage or is attached to a court order. If they find the activity is fraudulent, the service should also jump in to immediately stop the activity and offer funds for reimbursement and personal expense compensation. Your credit report can help flag fraudulent activity, even if it’s a medical identity theft issue. Stolen medical information that results in care will eventually be billed to you. If a medical facility can't reach you and a collector gets involved, you will see activity on your credit report pointing to the issue. You might also find unpaid charges to hospitals, doctors offices, and clinics. One way to get to the bottom of a stolen medical identity is to call your health insurance provider directly. Ask for a copy of the benefits paid out on your behalf and scrutinize them for accuracy. Your health insurance provider should also be able to help freeze your records or find solutions to temporarily put your account on hold while sorting out the damage. Malicious hackers and identity thieves aren’t the only people who take your medical identity into their own hands. Your own network of friends, family, and acquaintances could be borrowing your health insurance card and accessing your benefits to receive the care they need. Not only is this practice illegal and can land you in trouble, but it can also taint your own medical records and put your healthcare at risk. Protect your health insurance information and cards in a lock box and put a stop to any less than friendly behavior from your network. The most important thing in protecting yourself from medical identity theft is to act quickly. Jumping into action and staying diligent about protecting your medical identity can’t wait; otherwise, you risk compromising your bank account and health.